To compile this Proofread Anywhere review, we joined all of the Proofread Anywhere programs. We also scoured the web for member feedback to help you decide if Proofread Anywhere is a legit course or a scam. The Proofread Anywhere course is a program to teach people how to become successful proofreaders. Taking the course will give you the education you will need to become a general proofreader or a transcript proofreader. The course was start by Caitlin Pyle in 2012 after her proofreading blog became such a success. Caitlin has been a proofreader since 2007 and working in court reporting since 2009. The General Proofreader course has two course levels IGNITE and IGNITE PLUS. The IGNITE level is $497.00 one time payment and provides lifetime access. IGNITE PLUS is $597.00 one time payment and provides lifetime access. The Transcript Proofreading course has a different pricing structure. Level 1: Beginner Basecamp is a one payment of $77. You will gain access to Module 1 for 7 days. Level 2: Jumpstart is a one payment of $197. You have access to Modules 1 and 2 for an additional 30 days. Level 3: NextSteps is a one payment of $400. You then gain access to Modules 1-5 for an additional 60 days. Level 4: Launch & Earn is a one payment of $500. At this level you have lifetime access to Modules 1-9. Why Does The Transcript Proofreading Course Have This Pricing Structure? According to the Proofread Anywhere support team, their pricing structure for the Transcript Proofreading Course was set up to best help students. “Basecamp provide students access for a week to the first module to let them get their feet wet without having to invest a lot of money up front. 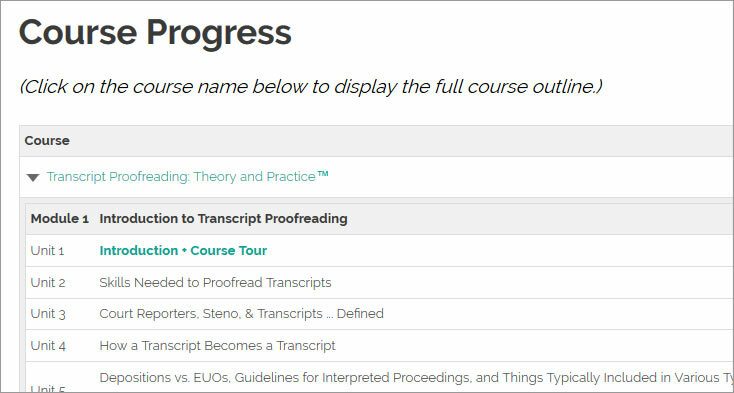 Since proofreading transcripts is so niche, it’s really helpful for students to get a further idea outside of the free seven-day mini course to see if the Transcript Proofreading course itself would be a good fit for them. “Outside of Basecamp, which gives access for a week, each module requires students to pass either a quiz, midterm, or final before they can proceed to access the next level. That way as well students can know they are on the right track to mastering the material and knowing if transcript proofreading is a good fit for them before they can pay for the next level. How Does Proofread Anywhere Work? 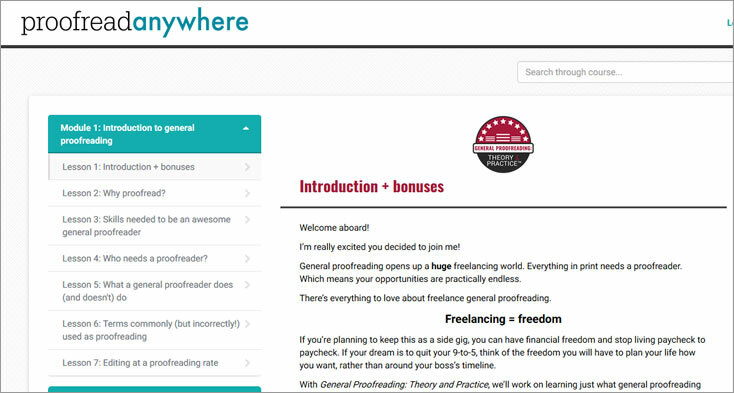 Proofreader Anywhere has two paid courses for you to learn the field of proofreading. These are the General Proofreader course and the Transcript Proofreading course. Each course is taken separately since they both deal with different areas of proofreading. There are also three free training and workshops you can take to see if proofreading is for you. We encourage you to take this free training first to make sure you want to pursue proofreading as a career. The General Proofreader course is a separate course from the Transcript Proofreading course. As a general proofreader, you would be working for anyone that needs to have proofreading done. This could include anything that is printed such as a novel, menu, cookbook, website content and so much more. Anytime something is going to be printed it needs to have someone look it over first. This is where a proofreader comes in. So it’s easy to see proofreaders are in high demand. This course will teach you how to make start a career making money as a general proofreader. The free workshop will introduce you to the world of proofreading. It will help you to decide if proofreading may be a career choice for you. This workshop is 45 minutes long. In this free workshop Caitlin makes it clear that proofreading is not for everyone. By the end of the workshop you will know if proofreading is for you. The 7-day proofreading e-course is designed to help answer your questions about what it takes to be a proofreader. Combined with the free workshop mentioned above, both are great tools to give you a firm foundation to decide if proofreading is for you. The General Proofreading: Theory and Practice will teach you how to start your own freelance business as a general proofreader. It contains 9 modules and 44 lessons. As a transcription proofreader, you would typically work for a transcription firm. Your main responsibility would be to go through a completed transcript and look for errors. This would include listening to the same audio that a transcriptionist has listened to looking for errors. The Transcript Proofreading paid course consists of 9 modules and 60 units. You can only access the paid course in increments. The level 1 Beginner Basecamp must be accessed first. Level 1 gives you access to Module 1 only and you will get access to this level for 7 days only. To make this Proofread Anywhere review completely unbiased, we searched the web to see what other members are saying who posted a Proofread Anywhere review. 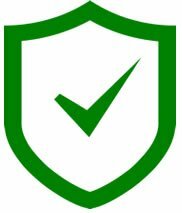 As part of this process, we looked at sites like SiteJabber, TrustPilot, RipoffReport and the Better Business Bureau website. These sites allow others to post their own Proofread Anywhere review to give feedback to other potential members. The main review sites had no one posting a Proofread Anywhere review so there was no information we could gather from those sources. On the Better Business Bureau website, there were no members who left a Proofread Anywhere review. The BBB site also had no rating for the Proofread Anywhere program. This is neither good or bad it just means there have been no complaints about the program to the BBB. There were a number of members that left a Proofread Anywhere review on FaceBook. At the time of this writing there were 136 reviews on FaceBook with an overall rating of 4.4 out of 5 stars. The vast majority of reviews on FaceBook were positive but there were a few negatives. A few members said that they felt the course was very “basic“, “too expensive” and “no payment plan“. In order to provide a very thorough Proofread Anywhere review, we signed up for both the General Proofreader course and the Transcript Proofreading course. We found both courses to be very well done. Each course provides an incredible amount of information. Most of the lessons are in video format which makes learning very easy. Support times are also very good. We emailed support and received a response back within one day. How Do you Know If Proofreading Is For You? 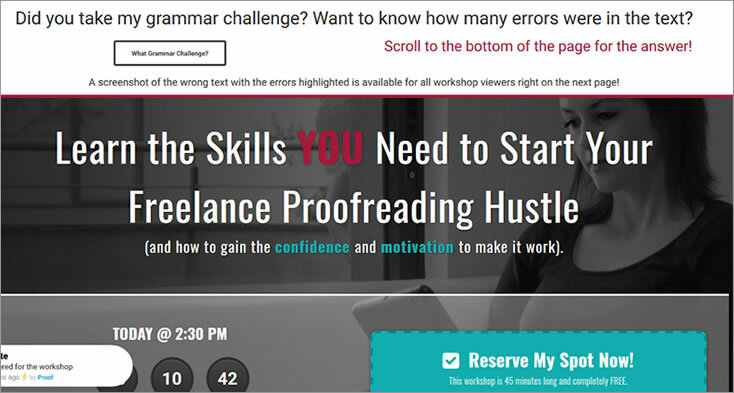 Before you jump in and take the full Proofread Anywhere courses, take the free training. Do I love to read? As a proofreader you will be doing a lot of reading so it’s important you love to read! Am I always correcting typos? Are you the type of person that always finds the typos on menus, in newspapers, or on any printed material? If so, proofreading may be the perfect fit for you. If you’re answer to these two questions is not YES, then you may not like proofreading at all. You may be more suited for transcription and may love Transcribe Anywhere. 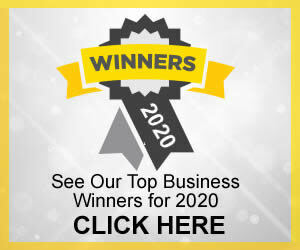 You may be someone who would rather make money as an affiliate marketer and the Wealthy Affiliate program would help you. As with any program, you will never be able to please everyone. We have found from our own experience that this course offers exactly what it says. It’s in depth training that will help you to become either a general proofreader or a transcription proofreader. The only caveat, proofreading is not easy and requires a certain type of person to be successful at it. It also requires a good educational foundation which the Proofread Anywhere course provides. 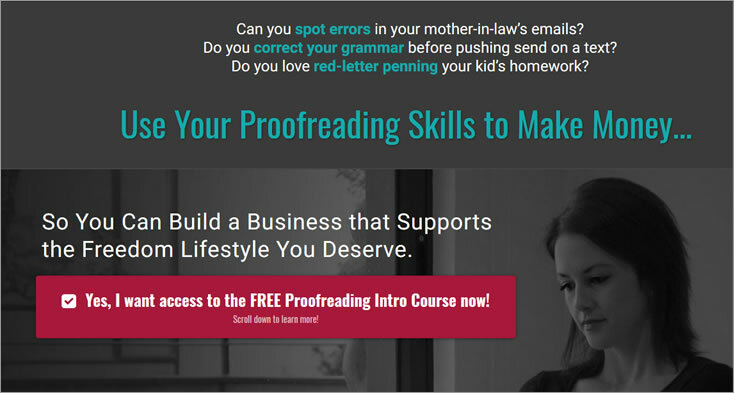 If you’re willing to study and work hard, the Proofread Anywhere course is the best option for you to learn how to be successful as a proofreader. 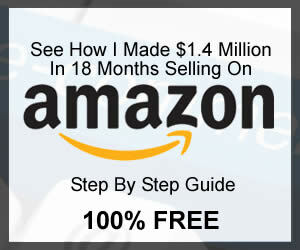 There is really no better program to teach you how to make money in the world of proofreading! Where is the 7 day free trial course? and this is a free workshop. This will help you decide if this is for you.